Highlander took their inspiration from the classic film with Connor Macleod as a Scottish swordsman who is also immortal. All the symbols are characters from the fantasy film and the backdrop is obviously straight from the film as well. Ever since the 1980’s when the film first released, tons of people were begging for a return and it is finally here. With some amazing graphics, this slot game has a unique theme. Actual footage from the movie can be seen in the game which takes you down memory lane. Scottish hills and lightning are featured as the backdrop behind the reels. With 243 ways to win rather than paylines and 5 reels, there are countless ways for a player to hit a major jackpot. All betting starts from 40p a spin and you can play it on any device. Most of the symbols are characters from the movie. 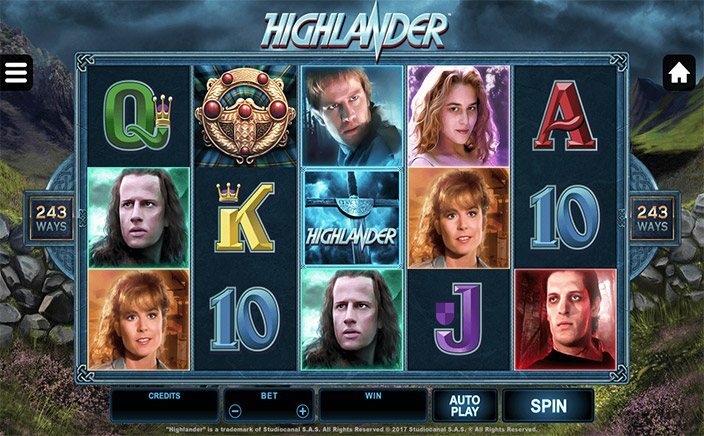 Brenda Wyatt, Connor MacLeod, The Kurgan, and Heather MacLeod are some of the characters that are featured. All the character symbols are the high-value symbols. MacLeod’s sword is the wild symbol of Highlander which can help the player get winning combinations by substituting all other symbols apart from the MacLeod clan one. There also some great wild symbol features where the backdrop changes as well. Features in the game are plentiful and there are tons of ways to hit the jackpot. If a player lands three or more of the clan symbol which is the scatter symbol, then they are eligible for ten free spins. If the player lands only two scatters, then those scatter symbols will turn into wild symbols which can increase winnings. Quickening Wilds is a unique feature from Highlander which happens randomly, turning a symbol into a wild with a lightning strike. Every time lightning strikes in the background, more symbols will turn to wilds which will result in more winnings. 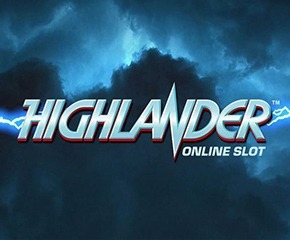 Any fans of the cult film will love Highlander which has some neat graphics and innovative features that include the backdrop. Original music from the movie also accompanies the game which makes it more mesmerizing. The RTP of the slots game is an impressive 97.00%.